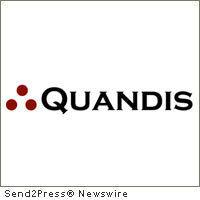 FOOTHILL RANCH, Calif., May 24, 2011 (SEND2PRESS NEWSWIRE) — Quandis, Inc., a provider of default management technology solutions, announced it has launched a service that automates searches on loan portfolios to determine if borrowers are active military personnel. The service reduces the risk of compliance issues in the default collection, loss mitigation and foreclosure processes. The Servicemembers Civil Relief Act (SCRA) of 2003 protects and covers all active duty military service members, reservists and members of the National Guard. The protection for these borrowers begins on the date of entering active duty and generally terminates 90 days after the date of discharge from active duty. The current process for determining a borrower’s military status is manual and inefficient. Quandis automates and delivers timely information to reduce risk of improper collections and foreclosure proceedings. • Judicial Proceedings such as; Stay of Proceedings, Execution of Court Actions, and Default Judgments. • Installment Contract Protections for Real or Personal Property include; preventing the rescinding or termination of contracts, preventing lenders from resuming possession for nonpayment, preventing breach of terms of contract, preventing foreclosures, evictions and termination of leases. The amount of interest a lender can charge is limited to 6 percent. The solution is designed for use by servicers, banks, default attorneys, trustees and various outsourced networks. Quandis’ new military search service (http://www.quandis.com/products/military-one.pdf) automates what is typically a manual process. Bulk searches are performed on entire portfolios or segments, returning the official military status report provided by the Department of Defense. The results are delivered in an electronic format that is suitable for importing into servicers’ back-office processing systems and also law firms’ case management applications. Founded in 2002 and headquartered in Foothill Ranch, California, Quandis, Inc. is a default management software provider specializing in web-based solutions for the lending industry. With over 25 years of experience in developing solutions, we understand the unique requirements necessary to deliver enhanced workflow and business-to-business communications. For more information, please visit www.quandis.com or call (949) 525-9000. Original Keywords: CEO Scott Stoddard, Servicemembers Civil Relief Act, SCRA, compliance issues in the default collection, loss mitigation and foreclosure processes, SaaS, California business news, mortgage industry, Quandis Inc, protects and covers all active duty military service members, reservists and members of the National Guard, HUD Quandis, Inc. Foothill Ranch California FOOTHILL RANCH, Calif.
REFERENCES: Banking News, CEO Scott Stoddard, Servicemembers Civil Relief Act, SCRA, compliance issues in the default collection, loss mitigation and foreclosure processes, SaaS, California business news, mortgage industry, Quandis Inc, protects and covers all active duty military service members, reservists and members of the National Guard, HUD Quandis, Inc. Foothill Ranch California FOOTHILL RANCH, Calif.